For those who ask if it’s safe to swim in Cape Town’s waters, here is a list of, not only the safest spaces in which to swim, but also some of the most beautiful. Cape Town has various ‘artificial’ tidal pools, as opposed to natural tidal pools (natural sea shore depressions that fill with tidal sea water). These pools exist because of white cement walls that retain the sea water after every high-tide. When the tide goes out, the sun is able to heat the water, making them wonderful, protected areas in which to swim, for children and adults. Other than St James’ tidal pool many of the pools lie hidden from the coastal road in False Bay, and are not that easy to find. However the views, from each of the pools on our list, are worth seeking out. 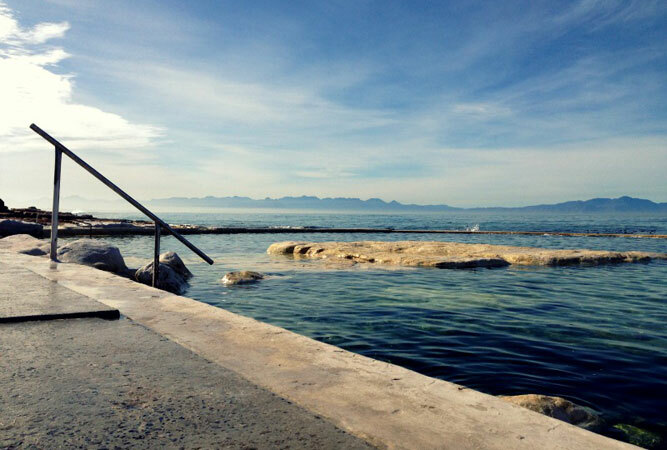 The tidal pool at St James is arguably Cape Town’s most popular, and most recognised. The suburb of St James, named after the church of the same name that once stood where the railway station is now, lies between Muizenberg and Kalk Bay, just managing to fit itself betwixt the steep mountain and the rocky shore. A goodly portion of its small beach is held by retaining walls forming a sea pool that, on public holidays and summer weekends, is filled to capacity (an early morning swim is the best way to avoid the crowds). Along its shore line runs a row of regularly photographed, colourfully painted, wooden changing huts. Dalebrook is quieter (fewer people know about it), it has an outdoor shower, space to sit against the wall, a change room, and large boulders that allow for skipping out into the pool before plunging into the Indian ocean’s slightly warmer waters. The low retaining wall allows for waves to break over the pool edge keeping the water clean. Take your goggles along. Wooley’s Pool is really popular on public holidays. But when we discover it, it is neglected; forgotten; largely ignored – possibly because of where it lies, in the crook of the bend of the coastal road, between Kalk Bay and Clovelly (the consistent road works have exacerbated the situation). Or because it’s autumn. The lack of parking might also be a factor. To reach Wooley’s one must head down a few steep steps off the ocean road, dipping briefly under the railway line. The pool is divided into two – a splash pool for little ones, and a far deeper tidal pool for those who can swim. The views across Fish Hoek are spectacular. Be cautious on the rocks closest to the sea, however tempting it is to walk there, as waves break over these, out of nowhere, during high tide. Miller’s Point has two access roads. 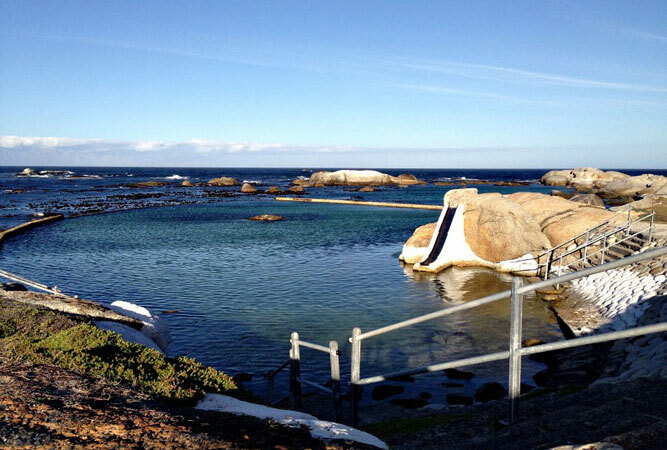 The tidal pool, which is particularly beautiful, is at the second (if coming from Fish Hoek), hidden from view in front of the main parking area (immediately opposite as you drive in). Or you can drive around to your left and park near the second boat slipway, slipping around the fence to find the pool just east of you. The pool is popular, particularly on holidays and weekends, but not quite as busy as St James. The area around the pool is grassed, with braai pits and change rooms. No dogs are allowed. 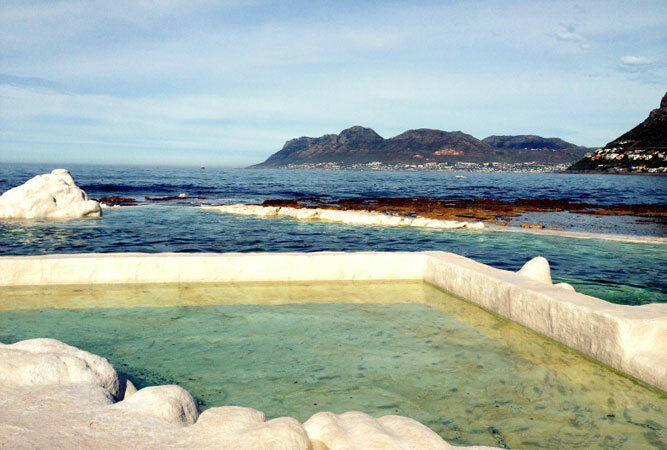 Easily visible from the train that runs between Simon’s Town and Cape Town, Glencairn’s tidal pool is similar to St James in the way that it holds a portion of the beach safely within its walls. It lies close to the Glencairn station, and is popular amongst swimmers, snorkellers and sunbathers as a result. Built in the 1920s, the pool wall could do with a bit of tender loving care. 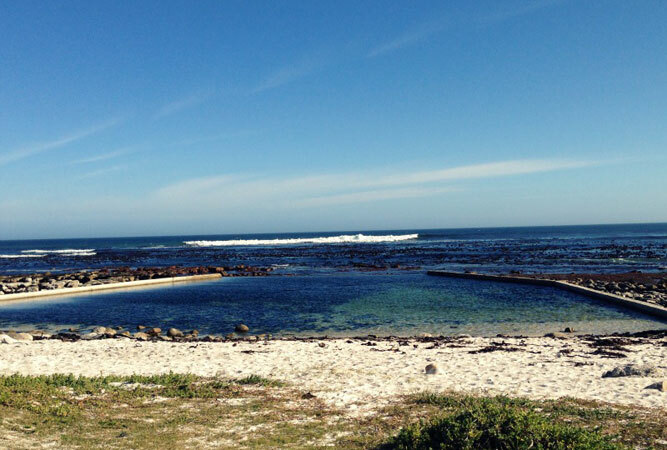 In Kommetjie, south of Long Beach at De Kom (Dutch for bowl), is a tidal pool. Greater flamingos have decided this is a choice spot (they’ve started re-visiting after an absence of 50 years) when we visit, and the tide is completely out, making swimming virtually impossible. 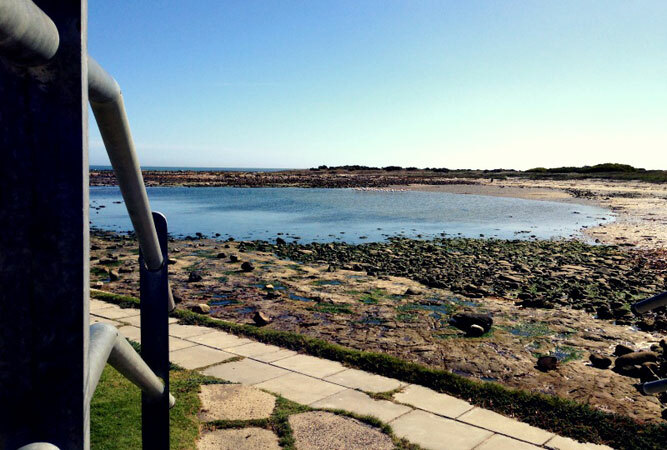 But when the tide is in, and particularly during summer, the tidal pool is much in use. It lies on the edge of the catwalk along the Kom, away from the lighthouse, with concrete steps and a handrail hewn into the edge to allow easy descent. Above the pool are grassy verges, and space under milkwood trees for picnics. 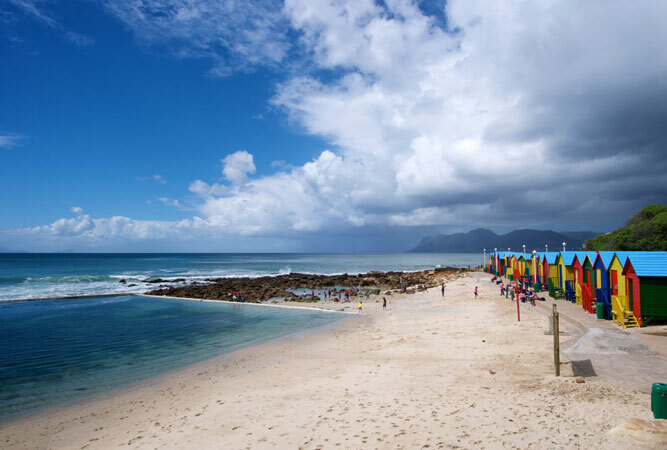 Soetwater’s two tidal pools lie south of Kommetjie’s Slangkop lighthouse, in a stretch of narrow, rocky coast way below the coastal road (fantastic lookout points). Soetwater gets its name from the many natural freshwater pools that form along the coast after rain. The first tidal pool is dry when we visit the resort, which also has a camp site and pretty picnic areas under gum pole pergolas. The second tidal pool lies next to the braai area, a beautiful pool that begs to be photographed. Just offshore are swathes of kelp forests, part of this ecologically sensitive landscape, where you often sight crayfish divers or hoop net fishermen.